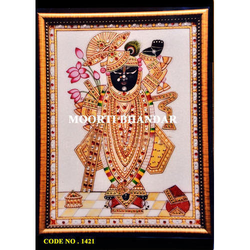 Aided by a team of qualified professionals, we are successfully presenting a quality guaranteed gamut of Marble Embossed Work Double Photo Frame. The looks of these products are very attractive and appealing. Fabricated with coral stones these clocks are very stylish and popular all over the world. Owing to our rich industry experience, we have been able to offer Marble Photo Frame We offer these Frame in diverse colors, sizes and designs as per customer’s requirements. Additionally, our Marble Photo Frame are completely checked from in order to ensure its flawlessness. Beautifully crafted piece of work, with meena peacock. Perfectly used for gifting and enhancing your house. After spending many years in this industry of Picture Frame we are presenting our new product Marble Picture Frame. This frame is very strong and having a very sporty look as well. It is made up of premium quality raw material and following all norms of industry. Our clients can get this bag on attractive prices from us. 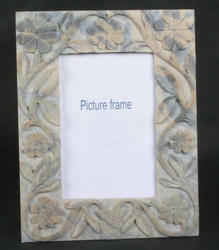 Fine Decorative Marble Photo Frame Available In Different Designs & Sizes. Photo frames of glass, steel and shell are common. Liven up your memories with ones made of white marble. Not only does the photo look more beautiful but the frame that holds it will always capture your imagination too. In order to cater the variegated demands of our precious clients, we are offering a wide range of Marble Picture Frame.